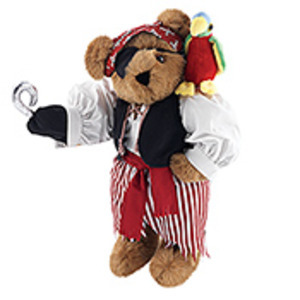 This pirate Capten with a removable hook on his paw wears a white pirate's shirt, a black vest, red and white striped pants, and a Bear and crossbones bandana with heart eye patch. He also comes complete with a colorful little parrot sidekick on his shoulder to tell you that he is hooked on you. It makes a lovely gift bear for pirate's fan.